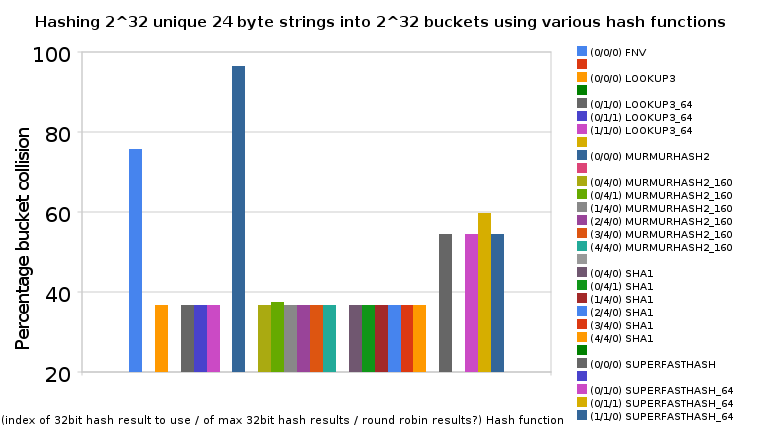 The best result is 36.8% hash collision for lookup3 (32bit; 4.4 million hashes/second), lookup3 (64bit; 4.4 million hashes/second), murmurhash2 (160bit; but not the round robin; 4.0 million hashes/second), and SHA1 (160bit; 0.9 million hashes/second). If anybody cares to comment, I’d be interested in understanding the math behind why it’s not possible to get a result with a lower hash collision rate than 36.8% for a large sample like this. So after all the balls have been thrown each bucket has a 1/e probablity of being empty – ie you expect there to be N/e empty buckets. Since number of balls = number of buckets, each empty bucket means a ball instead went into an already occupied bucket – ie number of empty buckets = number of collisions. For any “random” hash function with no collision anomalies this is the best expected case.